English - Deutsch - Äthiopischer Verein e.V. Ethiopia is a very beautiful country located at the Horn of Africa. It is rich in cultural and religious traditions with a very old history and impressive landscapes. Ethiopia is at the same time one of the poorest countries on earth. The late effects of feudalism and the cold war, as well as immense poverty, have made the beginnings and development of democratic structures and economic growth difficult. 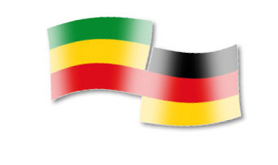 The German - Ethiopian Association was founded in September 1995 as a result of the initiative of former development workers who had the wish to remain in contact with the country and its people after their stay in Ethiopia. Together with Ethiopians living in Germany and other committed persons, we would like to promote good relationships between the people of two such different continents and to contribute to a better understanding and exchange of ideas. Since there are refugees coming to Germany these days, we offer some first information and useful website links. Everybody who is working in this field and interested in exchange is invited to join our working group. Interested friends are heartily invited to contact us. We publish a newsletter (28 to 32 pages) with the reports from our yearly seminar and news about Ethiopia. It is mainly written in German and has only exceptionally English contributions. You can order the printed German version or download it here. Members get it for free. We publish a regular short newsletter with links articles and news from Ethiopia. You can order it here. Once in a year, we organise a seminar with lectures, project reports and other information about Ethiopia. This seminar is open for everybody who is interested. The next seminar is from 27th to 29th of March 2020 in Kassel. The topics of the previous seminars are listed here. We also hold a yearly general assembly. We don't run projects in Ethiopia, but some of our members are engaged in other initiatives that support projects in Ethiopia. These and other initiatives introduce themselves here. Through our networking, we can contribute know-how and contacts for projects. On our website, you find information and news about Ethiopia. Most parts of the website are in German, but the news for example as well as a number of links that you find in the menue on the right hand side, are in English. If you use the function "suchen", you can enter key words to look for specific information. We are interested to cooperate with other initiatives that are active in or for Ethiopia. We offer to present their activities in our newsletter and put a link on this website (see "Äthiopien-Initiativen"). Members of our association have or know a huge range of literature about Ethiopia and help with information. You find here a list of titles including English ones. If you have specific questions about Ethiopia, we forward them by email to our members. Quite often, they find answers or can help. The association has temporary working-groups whenever members are interested to concentrate their work on a specific topic. We are happy about new members and welcome those most who like to be active and contribute to the association. Here, you find our statutes, the membership form and the folder - all documents are in German, the Communication and Networking Role of GEA is in English.